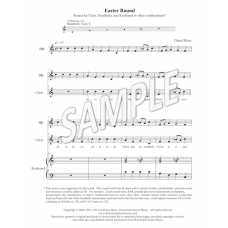 Easter round for choir, handbells, and keyboard or other combination of voices and instruments. (2 octaves, 6 bells used; also works with 1-octave chromatic bell set). Parts page - 1 page. 4 parts on a page to cut and distribute to the different parts. A good practice in watching the director for entries and cut-offs. * The score is one suggestion for the round. This round could also be done with a variety of other combinations, and more parts and measures could be added ad lib. 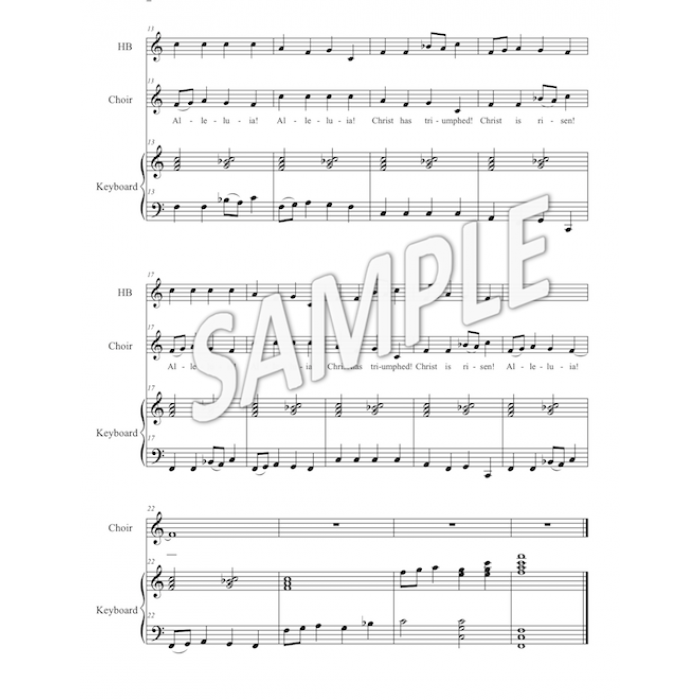 For example: 2-part, 2-part mixed choir, SAB, pitched percussion instruments (xylophone, glockenspiel, etc), handchimes, or other C instruments such as violin, oboe, flute. Another option: Cello, bassoon, or tuba play keyboard bass clef line while handbells instead play keyboard treble clef line (in that case, could replace measures 24-25 with a shaking of all bells ms. 24, and F-A-C notes ms. 25). 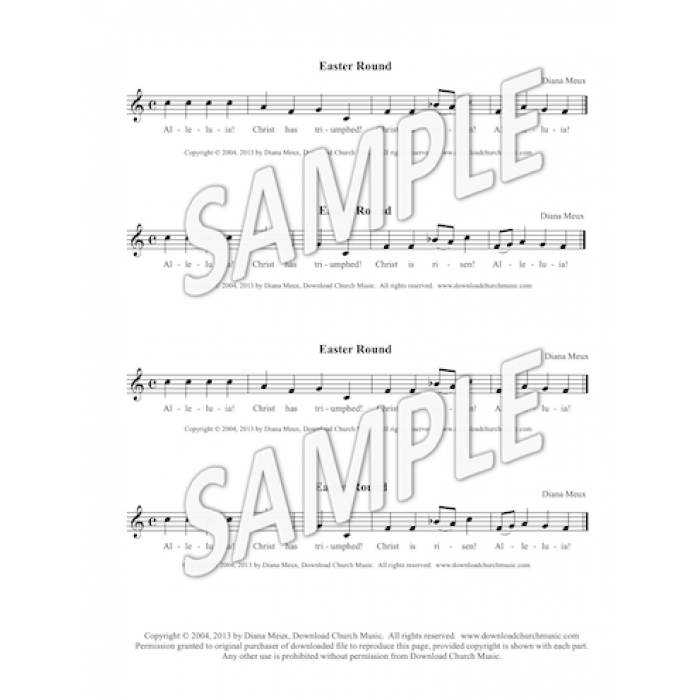 Permission also granted to print melody in bulletin to involve congregation. Reproducible. Price includes the right for original purchaser to make unlimited copies. Unison/Congregation Unison choir. Could also be for 2-part, 2-part mixed, SAB. 2-part Choral Unison choir. Could also be for 2-part, 2-part mixed, SAB. 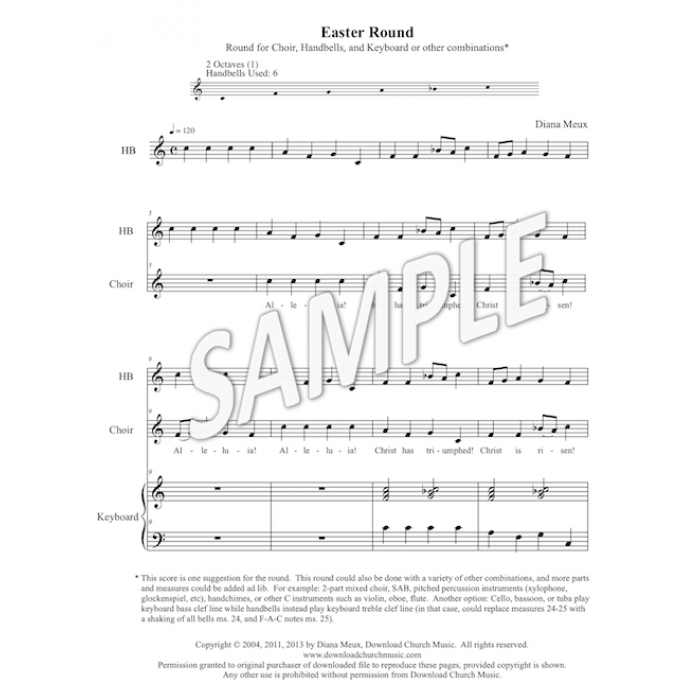 SAB/SATB Unison choir. Could also be for 2-part, 2-part mixed, SAB. Handbells & Choral 2 octaves, 6 bells used. Also works with 1-octave chromatic bell set. Anthem A shorter anthem. 2 pages. Includes 1-page parts page. Short A longer "short." 2 pages. Includes 1-page parts page.